Looking more like a computer company than a car company, Hyundai ships Android Auto on 2015 Sonatas and unlocks it for owners of the 2015 Sonata with a software update. Android Auto, a product that up until now was only talked about by industry insiders and journalists, just shipped this week. Well, it didn't really ship, because it is being released as a software update to the 2015 Hyundai Sonata that existing owners can download. It will also be factory-installed on new models. Android Auto is an attempt to incorporate the convenience and safety of pairing a smartphone to a car without the distraction. It also points out that the car has become a software-driven mobile device, not unlike computers and smartphones. Android Auto reduces driver distraction from smartphone use by integrating the smartphone with the console stereo system that the industry calls a head-unit. It focuses the driver's attention in short, safe interactions with the console display when using Android apps. According to Hyundai, "at any given daylight moment across America, approximately 660,000 drivers are using cell phones or manipulating electronic devices while driving, a number that has held steady since 2010." Distracted driving endangers drivers and their passengers, as well as those who share the road with them. According to the National Safety Board, 25% of all accidents are caused by drivers distracted by smartphones. Using a smartphone while driving also produces a lousy user experience. Smartphones are awkward to hold and manipulate in short intervals of attention, too short to accurately coordinate fine-grained hand-eye motor control and get tactile confirmation that a task was completed. And there really isn't a handy place in a car to keep a smartphone between uses. Extreme distracted driving is attempting to retrieve a phone that fell into the crevice between the seat and console at 60 mph. 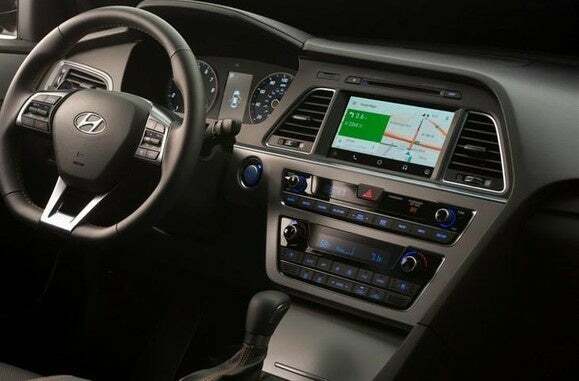 To enable Android Auto, existing 2015 Hyundai Sonata owners outfitted with the Navigation feature can download an update to a USB drive, plug it into the car's USB port, and rewrite the software installed in the factory on the head-unit. When the smartphone is plugged into the head-unit with a USB cable, the user is prompted to download Android Auto along with mobile apps. Android Auto requires Android 5.0 or above. After installing the software, the driver interacts with smartphone apps using voice commands or short, carefully designed interactions on the console's touchscreen. Press the microphone button on the touchscreen and ask to navigate to a destination or call a person in Google contacts. Touch the entertainment button and interact with a music app, such as Spotify re-engineered for safety and approved by Google's Android Auto Play store team. No fumbling for a smartphone and no struggle to balance attention between the phone's screen and the windshield. Android Auto also locks out any apps not designed for safe driving and approved by Google. It's a better and safer user experience. Once consumers see Android Auto in use, they'll want a car with a compatible head-unit. Many older head-unit designs have some level of integration with smartphones, such as hands-free Bluetooth calls or playing music from the smartphone using Bluetooth on the car stereo. The added integration with Google navigation, contacts, places, and search, and a broad selection of Android Auto apps, make Android Auto a better and more comprehensive infotainment product. And it's not alone – Hyundai spokesman Miles Johnson said a similar update will be available for Apple Car Play in a few months.